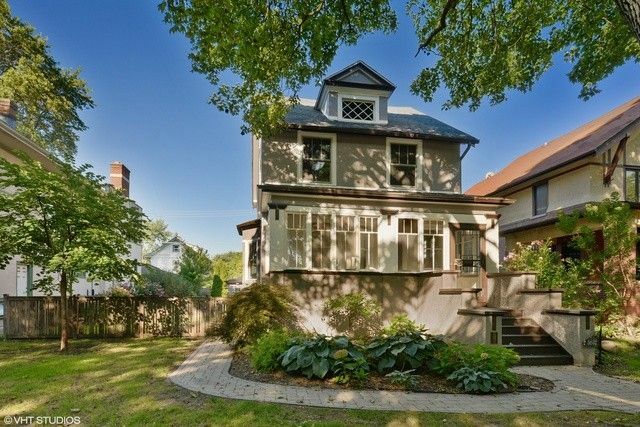 Immaculate light filled craftsmen home on a 50x136 lot located in The Villa section of exploding Old Irving Park. Walking distance to both blue line and metra, the stunning home sits on a picturesque tree-lined boulevard street in landmarked district. Upon entry, you are greeted by a stately foyer accompanied by elegant staircase & stained glass windows, leading to an expansive main level with living room, formal dining room that open's custom chef's kitchen. Just off kitchen is a powder rm & access to back deck with pergola that leads to luscious backyard with brick-paved pathways, 2 patios, and 2-car garage that opens up to alley & backyard, allowing for seamless entertaining. Beautifully detailed restoration of original woodwork throughout the main and 2nd levels boasts historic charm. 2nd level has 3 generous bedrooms & stunning marble bath. 3rd level is unfinished but plumbed for luxe mstr suite & bathroom. LL offers spacious family rm, laundry rm, half bath, and storage. Directions: Addison (3600N) to Harding (3930W) North 1/2 block .